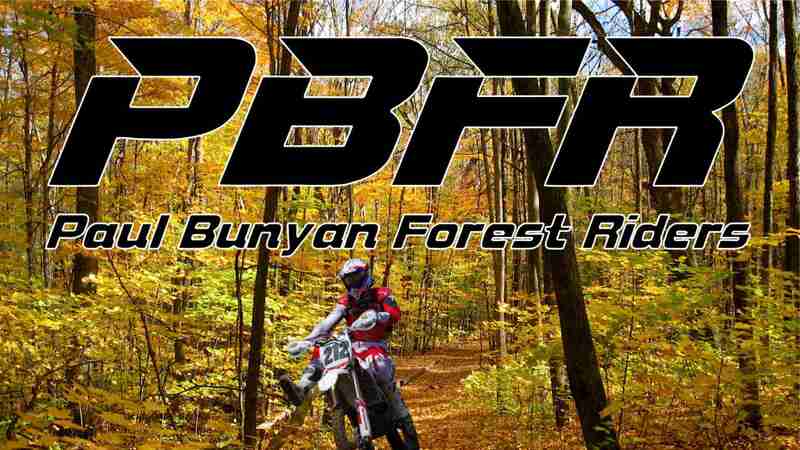 The Paul Bunyan Forest Riders have created a downloadable PDF Trail map that will help users of the Martineau OHM Trail System (also referred to as the MRT) locate riding opportunities in the Paul Bunyan State Forest. Trails and waypoints may vary due to local weather, logging, changing conditions and satellite reception. Use other navigational aids and local signs along with this map as required for guidance. The PDF Trail map and corresponding waypoint information may only be used as a reference for navigation. Riders who use the MRT and this map do so at their own risk. The PDF map listed below is designed to be printed on both sides of a single 11″ x 17″ sheet of paper. You can try printing it on 8.5″ x 11″ paper but it will be harder to read. The two links below are for the front and back sides of the map. The files are very detailed, so may take up to 30 seconds to download. You can also download a Geo-Referenced map of the Martineau OHM Trail System for use with the free cellphone app “Avenza Maps“. Avenza Maps is a free download from Android Play Store and Apple App Store that allows you to use the GPS function on your cellphone to display your location on the map. It works very well. For Garmin users, there is a GPS Track Map from 2014. Although this GPS map is fairly current, there have been some changes to the trails since 2014 due to logging, etc. The Paul Bunyan Forest often has active logging in areas, which means the trails can have small reroutes from month to month. All that being said, the first two links below for the printable PDF map are the most current and detailed document. The third link is a Geo-Referenced map for use with Avenza Maps and is also current. It however, does not have the same detail as the printable PDF map. The forth link is the Garmin the GPS Track Map, which was current in 2014, but still very useful today. Trail intersections on the MRT are signed using the MN Emergency Trail Locator System. The alpha-numeric signs represent the GPS coordinate at that location. The 6 digit number on the map shows the location of the sign on the trail. In order to reduce clutter the alpha designation “UN” is not shown on the map since it is the same for all locations on the map. OHM-only (Off Highway Motorcycle) trails are marked in red. ATV-only (All Terrain Vehicle) trails are marked in green. Dual-Use (ATV & OHM) shared trails are marked in blue. The borders of the map have a numbered grid. The numbers on the top and bottom of the map correspond to the first three numbers on the sign. The numbers on the sides of the map correspond to the second three numbers on the sign. Look up or down from the grid to find the first three numbers and left or right for the second three numbers to find the sign location on the map. The MRT is marked with three separate loops: NW Loop, SW Loop, and East Loop. The loops are signed to enable you to follow them and lead you back to the point you started from. Trail mileages shown on the map are the distance in miles between the open intersection points. Loop mileages are shown in the loop legend box.